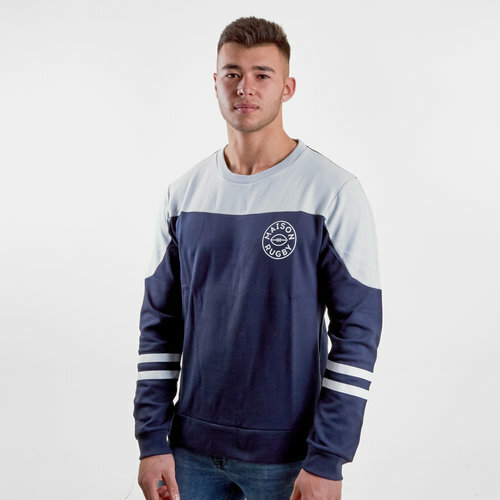 Keep warm off the field whilst maintaining a stylish rugby inspired look with the Rugby Division Birdie Graphic Off Field Rugby Sweatshirt in Dark Navy. This men's long sleeve sweater from French rugby inspired fashion brand, Rugby Division, features a modern look with stripes upon the sleeves and a block pattern on the shoulders. Made from cotton and polyester material, this top is ideal for keeping the wearer feeling warm and comfortable when not in action on the pitch. Great as part of a casual look to be worn on rest days, maintain your rugby obsession with the Birdie Graphic Off Field Rugby Sweatshirt.